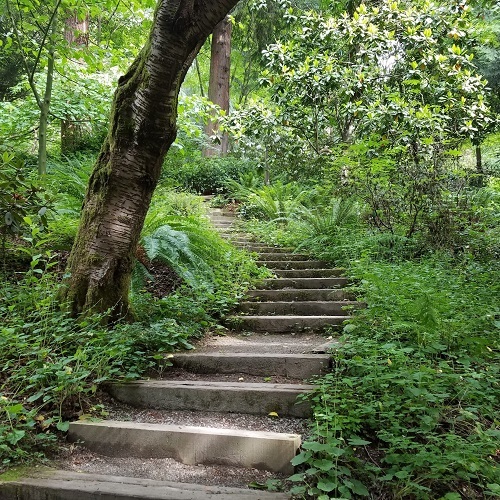 Saturday, Apr 27, 2019, 10 – 11:30 a.m.
Join UW Botanic Gardens and Cascadia Forest Therapy for a unique forest bathing opportunity in the Washington Park Arboretum. Forest bathing (or shinrin-yoku) has been popular in Japan for decades and is gaining momentum in the US. The practice encourages you to walk in the forest at a slower pace and take in the atmosphere around you. Multiple scientific studies have shown that it lowers stress and blood pressure levels, while increasing immune system functioning, making you more resilient to diseases and illness. These walks are slow-paced and generally cover less than a mile of trail. During this time the guide, in partnership with the forest, will offer an evolving series of invitations crafted to help participants slow down and open their senses. The opening of one’s senses encourages mindfulness, which readies the heart and mind to be fully present in the natural world. Come discover the medicine of being in the forest.